Home>1 Channel Drop Over Cable Protector - 36" x 5.25" .75"
1 Channel Drop Over Cable Protector - 36" x 5.25" .75"
This FastLane single-channel drop-over cable cover provides a quick solution for protecting a cable or cord with an outside diameter measuring up to 0.5" wide. Constructed out of UV-stabilized polyurethane for durability, this cable protector can support foot or light vehicle traffic weighing up to 2,100 lbs per axle. Color: Black. 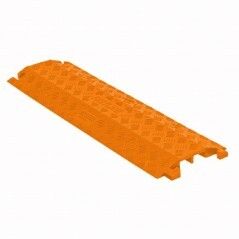 Path: Home > 1 Channel Drop Over Cable Protector - 36" x 5.25" .75"